I hadn't even played through it when we reached agreement, but I've played through Ethan's amps before, so it was quite likely it wouldn't disappoint, and I wasn't worried. He said it was good-sounding when playing clean, and he knew that's how I play most of the time, so I guess he figured I'd make good use of it. Spoiler alert: he's right. Take a look at this work of art. 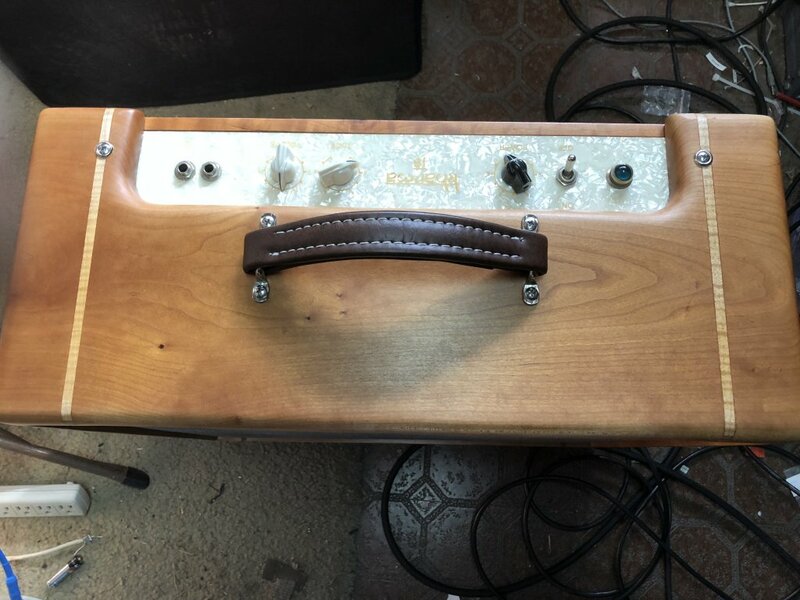 All-wood cabinet, Wood inlay trim, mother-of-toilet-seat faceplate, and though the yellow lettering has to be looked at from just the right angle to be legible, the controls are simple: 2 inputs, one high and one low, volume, tone, and a power-soak control (I forget whether it's Carvin or Peavey who uses that term, but it's an insult to this amp to compare it to those two brands). It allows you to break up at lower volumes, but the interplay among the three controls will give me untold hours of joyous experimentation, because there appear to be an infinite number of tonal variations available. A Gretsch 5129 with DeArmonds--HolyMamaBabyHoosierDaddyGreatGooglyMoogly! These two were made for each other. This is where I discovered all the tonal interplay with the three knobs. This merits intense research into just how cool I can sound. Again, wondering what I did to deserve this. Is Ethan trying to wean me off solid-state amps? Then it occurred to me that I've done a couple of favors for people recently, one of which I described as "making a deposit in the kharma bank," and maybe this was the reward? Then I noticed Ethan named this model the "Kharma 18." Coincidence? You decide. You must've done something right. That is a beautiful amp but if I remember correctly Powdog mentioned that amp being a “left handed” amp. That explains a lot. Good thing I'm left-handed, even though I don't play that way. 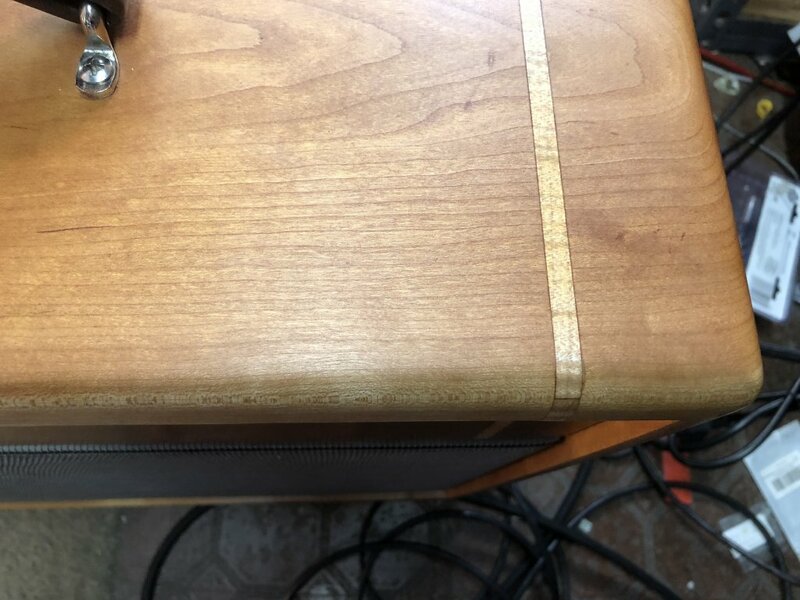 I took a good close up look at that amp ,and with all the craftsmanship and detail work that went into it looked very Expensive. 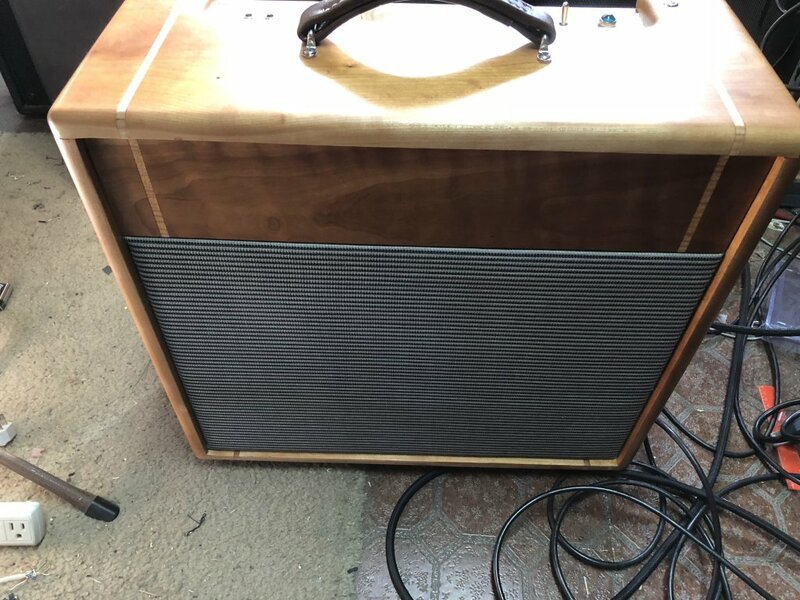 I've seen alot of pricey amps not even in the same League as that ,so I just walked away wondering who would end up with that beautiful work of Art. Now I know. FRANK GIFFENNNN ! You have an amazing piece of amp art there! What kinda style would it represent, maybe valco inspired? Plus I have a 5129 so I'm looking forward to knowing more about that coupling. With its roots in an AO-35 Hammond reverb amplifier circuit, it is powered by a pair of cathode biased EL84’s. It has a low gain phase inverter which gives it headroom, and a 5Y3 rectifier which lets it compress and get some hair at higher volumes. The tone control is a Hi pass/Lo pass type instead of the typical treble bleed found on many amps. The power scaling circuit is the VVR type developed by Dana Hall and his brother. Similar to using a Variac to lower wall voltage. I built the cabinet maybe 10 years ago for an 18 watt project. Never really found a home. Solid Cherry with oak inlay. 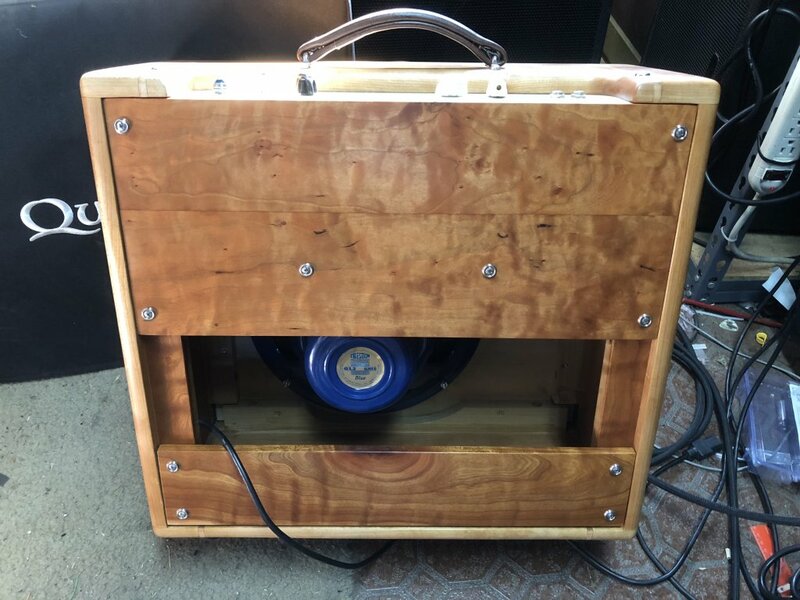 The speaker is a Celestion blue alnico. Karma can manifest over the course of many lifetimes. Oh man Frank! That's a beautiful piece of audio technology! 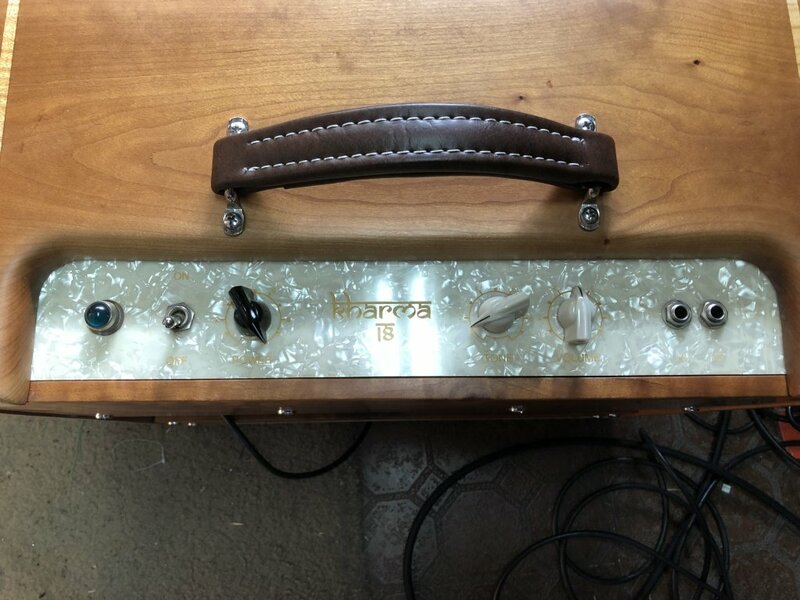 I've built a few amps myself, over the years, but nothing that visually compairs to that little gem. Congratulations on the new amplifier, it's a beauty. Custom 2-tone, padded vinyl cover (gold piping was an option but I skipped that so as to avoid controversy) has been ordered and based on the email I received today, is in production as we speak. Once I can protect it, I'll consider hauling it around. Sweet! That amp partnered with the P90 equipped Eastman has my imagination running wild! Enjoy, and congratulations to both of you (giffenf & Powdog). I makes amps out of those AO-35 units all the time. Typically Matchless Spitfire clones. Mine are more rustic affairs dumped into old dynamite crates. When I mentioned that the amp’s roots were an AO-35 I didn’t mean that it was a rat rod made with an AO-35. Just similar aspects of the circuit. I hadn't noticed before that the faceplate is pearloid - I love it! I love these Gretsch brotherhood stories.